Since 1993, the Eichler Network has been dedicated to supporting the lifestyle of the thousands of homeowners in Northern and Southern California who own an 'Eichler' home. Eichlers are architect-designed mid-century modern homes built by merchant builder Joe Eichler between 1949 and 1974. In recent years, the Eichler Network expanded the scope of its homeowner base to include thousands of additional mid-century homeowners in Sacramento and southern California who live in Streng Bros., Palmer & Krisel, Cliff May, and other Eichler-like mid-century modern classics. The Eichler Network supports a home-maintenance referral service of participating service companies (from remodeling to radiant heat and roofing maintenance) and products (from specially designed insulated windows to customized exterior siding). For nearly 25 years, these hand-picked service companies and experts have banded together to offer their expertise as needed by mid-century modern owners. The Eichler Network's team goal, as its motto so aptly puts it, is to emphasize quality workmanship while "preserving the wonderful world of Eichler homes" and other mid-century modern classics. 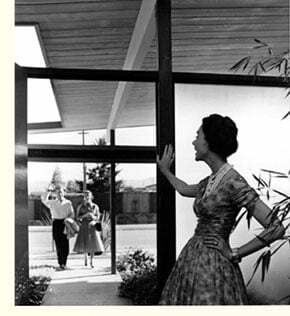 In addition to Eichler Network Online, the Eichler Network publishes CA-Modern, a quarterly full-color hard-copy magazine which contains a mix of features on California's rich legacy of mid-century modern homes and the people that live in them, home maintenance solutions, and other features that focus on the modern home and its lifestyle. The Eichler Network also publishes its annual Home Maintenance Directory, which profiles the service companies that maintain the homes. These publications are mailed free to a select 20,000 Eichler, Streng, and other select homeowners (with a readership of 42,000 adult consumers) in Northern and Southern California at their modern home address. Paid subscriptions are also available. Service companies in the San Francisco Bay Area, Sacramento-Davis, and Southern California areas interested in exploring marketing opportunities through the Eichler Network should contact the Eichler Network at 415-307-3801. Marin/San Francisco - Eichlers of Terra Linda, Lucas Valley, Marinwood, Sleepy Hollow, Strawberry Point, and San Francisco. Also includes the Alliance homes of Terra Linda. East Bay - Eichlers of Walnut Creek, Concord, Castro Valley, and Oakland. San Mateo - Eichlers of San Mateo Highlands and 19th Avenue Park, Burlingame, Foster City, Menlo Park, Redwood City, Hillsborough, Atherton, and Portola Valley. Palo Alto - Eichlers of Palo Alto, Mountain View, Stanford, and Los Altos. Sunnyvale/San Jose - Eichlers of San Jose, Sunnyvale, Cupertino, Santa Clara, Saratoga, and Monte Sereno. Sacramento - Eichler and Streng homes of greater Sacramento and Davis. Los Angeles County - Thousands of custom modern homes throughout greater Los Angeles County. San Fernando Valley - Thousands of Eichler, Palmer & Krisel, and other modern homes in numerous towns throughout the valley. Orange/Long Beach area - Eichler, Cliff May, and other modern homes in Orange, Long Beach, Seal Beach, Huntington Beach, Lakewood, Costa Mesa, Newport Beach, Tustin, Santa Ana, and many other cities.